Remember the fun you had playing Clue as a child with “Cluedo” slots from Wagerworks. This exciting game offers players an old favorite as well as the chance to spin for a twenty five thousand coin jackpot. With denominations ranging from one dollar to twenty-five dollars, players will find themselves in the position to uncover a large amount of money. The exciting graphics of Cluedo slots offer all of the appeal of the board game, with the familiar characters, rooms, and weapons. Symbols used on the reels include the Cluedo symbol, Miss Scarlet, Mrs. Peacock, Mrs. White, Professor Plumb, Colonel Mustard, Reverend Green, the revolver, the dagger, the spanner, the rope, the lead pipe, and the candlestick. With a jackpot of up to twenty five thousand coins, players will have a great time solving the familiar mystery as they spin the reels in hopes of a truly fantastic payout. 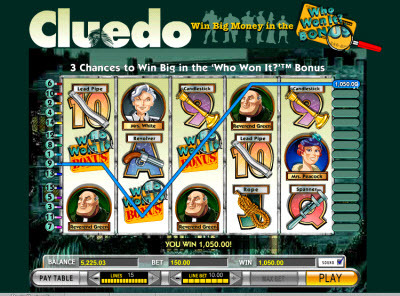 “Cluedo” slots offers fifteen total paylines, and while there is no autoplay feature, there is plenty of excitement to keep players enthralled. The first three paylines in this game run horizontally through the top, center, and bottom positions of the game’s five reels. The remainder of the lines run in an array of diagonal and horizontal combinations, giving players a wide range of ways to hit a winning combination. 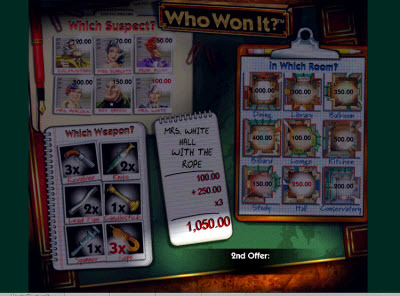 There are many payouts to be found in “Cluedo” slots, and your win is multiplied by the number of coins bet per line. 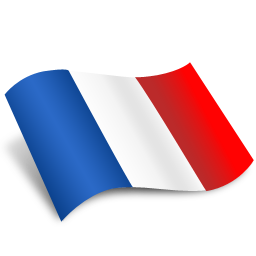 The jackpot is awarded when five wild symbols appear on a single payline and pays twenty five thousand coins. Twenty five hundred coins are awarded for five “Cluedo” symbols, while four pay five hundred coins, three pay seventy-five, two pay five, and one pays two. Five Miss Scarlet symbols pay one thousand coins to the winner, while four pay two hundred fifty and three pay seventy. Five Professor Plum symbols are worth seven hundred fifty coins, four are worth one hundred fifty, and three are worth sixty. When a player gets five Miss Peacock symbols on a payline, they are awarded six hundred coins, with four paying one hundred twenty five and three paying fifty. Five Colonel Mustard symbols are worth five hundred coins, four are worth one hundred, and three are worth forty. Five Mrs. White symbols pay four hundred coins, four pay eighty-five, and three pay thirty. Five Reverend Green symbols pay three hundred coins, four pay seventy-five, and three pay twenty. Five revolvers pay two hundred fifty coins, four pay sixty, and three pay twenty-five. The dagger symbol offers two hundred coins for five, fifty for four, and twenty for three. One hundred fifty coins await players who get five spanners, forty-five for four, and fifteen for three. A one hundred coin dividend is paid for five ropes, while players getting four are paid forty coins and players who get three are awarded twelve coins. Ninety tokens are given for five lead pipes, while thirty-five are paid for four and ten are paid for three. Eighty coins await players getting three candlesticks, with thirty for four and seven for three. Three bonus symbols on a payline award the bonus game, which allows players to earn even more money as they work to solve the “Cluedo” mystery, proving that there are many ways to win big with this exciting game.